Not only the Bride and Groom need celebrating on their wedding day, this bespoke Prosecco is designed to thank anyone who's helped make the day a special one. 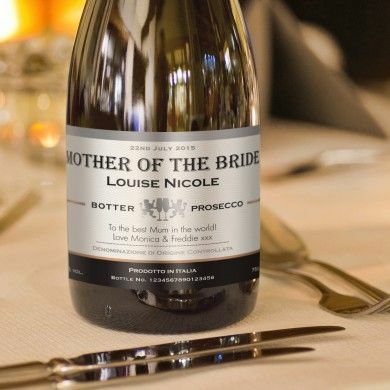 From Father of the bride, to Mother of the Groom, Maid of Honour to Usher, this Prosecco includes the date of the wedding, their name and a message from you. What better way to include everyone on the wedding day of a happy couple? This quality Prosecco speaks for itself once opened will reveal a crisp taste and delicate bouquet, the bubbles release hints of peach and apple followed by notes of acacia and wisteria creating a fresh and light feel on the palate. This fine sparkling wine is perfect for toasting the happy occasion and is as unique and individual as the recipient. 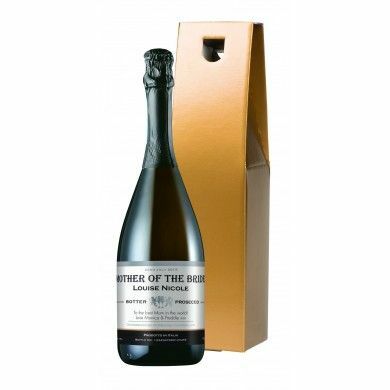 The bottle is presented in your choice of gold gift carton, or a silk-lined black giftbox.